Originally my dessert plan for fake Thanksgiving was to make a classic apple pie, and add some fun how-tos on making the top crust more fun and playful (I still plan on doing that post, it just might not be part of this Thanksgiving spread). However, the day before the big meal I was discussing the menu with my friend Sara, and she made a face. Her patented “meh, that sounds boring” face. Instead, she suggested, I make a pecan pie. 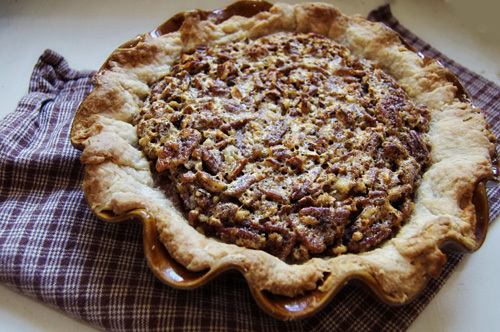 I explained that I already had a pecan pie on the blog, and that the point of fake Thanksgiving was to offer up new, exciting Thanksgiving ideas. Her response was something along the lines of “well, put bourbon in it.” I can always count on fellow southerners to suggest boozing things up. So, when I was making the pie dough, I added some bourbon. And then a splash more. 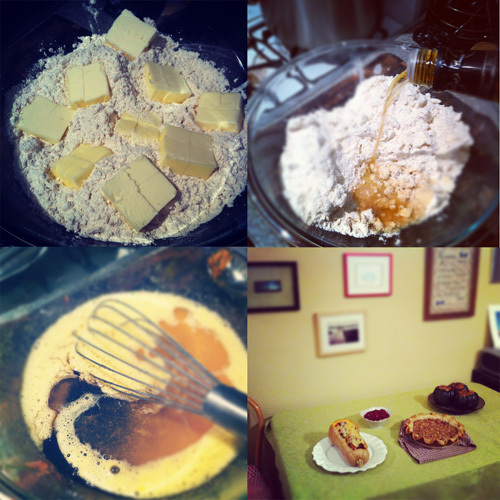 In fact, I substituted almost all the water in the pie dough recipe for bourbon. And then later, when I was making the filling I added about a quarter cup of bourbon. And then I figured, if I’m going to do this I might as well do it right and added another quarter cup. Then topped it off with a splash more. This is may be the booziest pie ever. But I have to say, it’s also one of the best pies I’ve ever had OR made. I’m not just flattering myself, I’m pretty critical of what I make. This is amazing. As in, I want to make another one right now just to eat by myself. 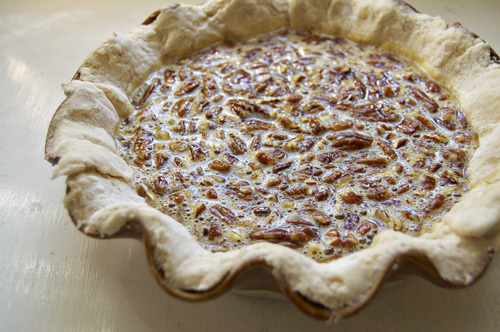 If you’re thinking of making a pecan pie for Thanksgiving and your family is cool with a little (lot) of bourbon, DO THIS. Start with your dough. Sift dry ingredients. Add shortening and break it up with your hands as you start to coat the flour. Add butter and work it in until it resembles coarse corn meal. You should be able to pinch the dough together to form chunks. Add the ice water/bourbon, a little at a time, stirring in with a wooden spoon Only add as much as it takes to make a ball. Any more than that and you will be left with chewey crust. However, make sure you’re using enough for your dough to hold together. If you’re adding honey, now would be the time to whisk it into the water. Be cautious with the amounts you chose, you don’t want it to get too sticky, I don’t recommend more than 3 tbsp. Form a ball and divide it in half. Cover each half with saran wrap and flatten into a disc shape. Pop in the fridge for at least half an hour. Take half the dough out of the fridge, and roll it out on a lightly floured surface. It also helps to cover your rolling pin with flour. Fit the dough into your pie dish. The rest of your dough you can use for another pie. Next, time for filling. Melt butter and set aside to cool. Beat eggs, then add sugar, syrup, bourbon, and butter. Whisk together. 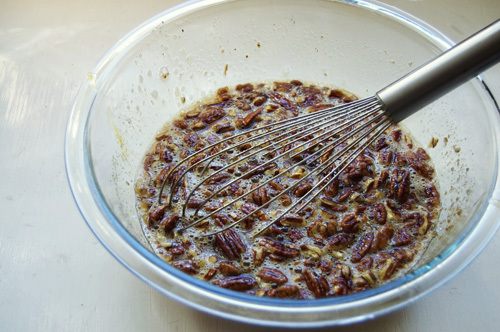 Incorporate pecans. I’m making this for the holidays! I am super excited. P.S. Thanks for the chia seed kambucha. You are the BEST! Definitely made this for Thanksgiving today. It was SO boozie, especially with the 1/2 cup bourbon for the pie filling. But for three college guys, I think it all worked out.